There's a reason why this is one of my favorite events for royal sparkle watching, each and every year. Me and my caps lock are about to tell you why. You wanted sparkle? 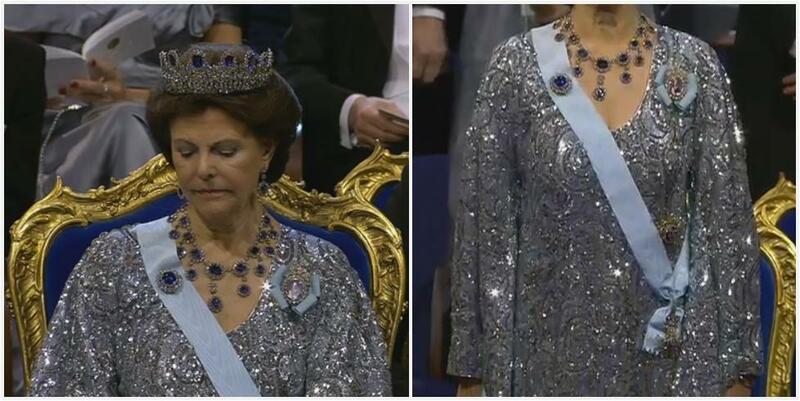 Queen Silvia’s got your sparkle RIGHT HERE. She took on the daunting task of matching the incredible sparkle of the Leuchtenberg Sapphires with a disco ball choir robe, which she carries off with more gravitas than you’d think possible when the words “disco ball choir robe” are involved. Thanks for the giggle, Sils. Crown Princess Victoria is here to single-handedly make you fall in love with the Cut Steel Tiara, that polarizing non-gemstone diadem. She realizes that she might have left some of you behind even after her magnificent Nobel 2010 appearance, so she’s giving it another shot with this bespoke H&M gown (yes, H&M). This is just so REGAL. I’ve been waiting for Princess Sofia to wear a dress truly geared towards showcasing the emerald part of her Emerald and Diamond Tiara. I’ve also been waiting for her to wear something other than that Emerald and Diamond Tiara. So, hilariously, she did both at the same time. Her bespoke House of Dagmar emerald green dress was paired with the Cut Steel Bandeau, a piece which we’ve previously seen exclusively on Crown Princess Victoria. It does suit Sofia’s head better than Victoria’s, even though it will never be a tiara highlight for me. 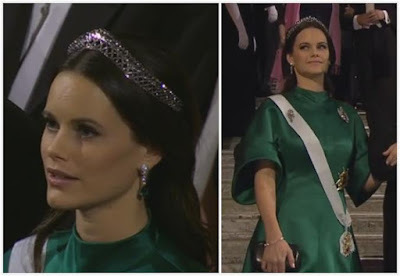 She also wore the emerald and diamond earrings from Queen Silvia that she wore last year. Princess Madeleine went full princess in the most Disney fashion, with an assist from a soft pink Fadi El Khoury ensemble with a big flowered skirt and a blouse top. Expressen reported that she was unhappy with the outfit and the tailors were fixing it into the early hours of this morning. If that’s true: WORTH IT. It’s my favorite Swedish designer in my favorite color for Madeleine, and it’s fantastic. She wore the Connaught Tiara. This is another example of something special for the event – she was first allowed to wear the tiara for Victoria’s wedding, though she has used the drops on several occasions – and I think she wears it best of all the current Swedish ladies. There were a few interesting head ornaments in the crowd. Here’s Bettina Bernadotte wearing one of her tiaras, topped by stones in multiple colors (here’s a closer look), for a little modern contrast to the older gems on display. And finally, the Nobel Peace Prize was awarded earlier in the day in Oslo, with the Norwegian royal family in attendance in coordinated blacks. From Crown Princess Mette-Marit and Norwegian designer Mariette comes...an eyelet hoodie dress? Sure, why not. 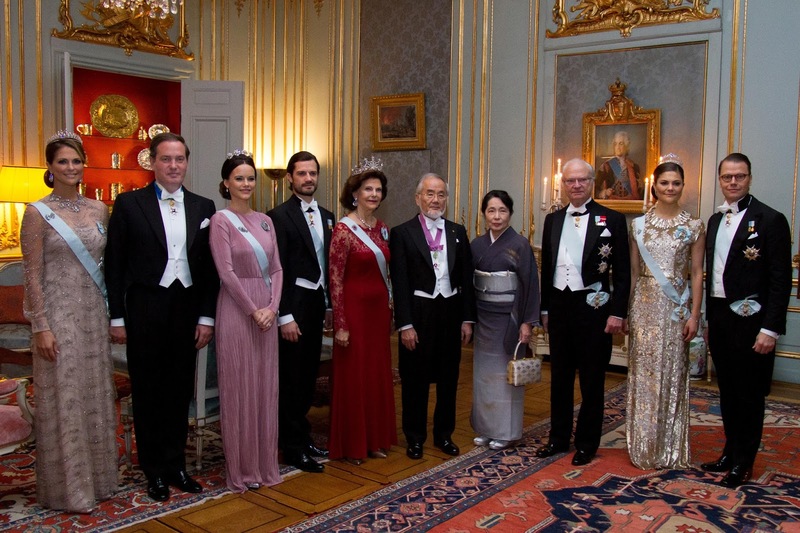 This is not a gala event - obviously - but that doesn't mean Mette-Marit didn't bring us some interesting jewels. 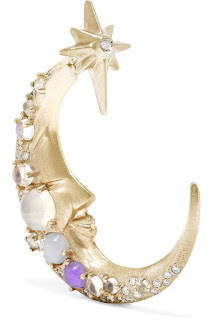 Her earrings are what catch my eye, pricey new numbers in a friendly crescent moon crafted in gold and set with moonstone, black agate, purple chalcedony, and diamonds, from Venyx designer Eugenie Niarchos. They're a fun detail, and she's pulling them off. Who's your Nobel best dressed this year? 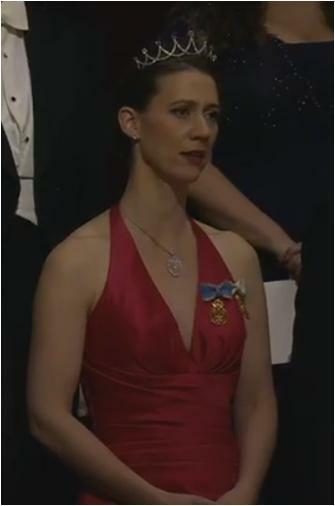 While the Swedes get their gala on, the Norwegians go black tie. Crown Princess Mette-Marit stuck to Norwegian design with a dress from the brand Fall Winter Spring Summer (FWSS). It's a very M-M choice, what else can you say? I do like the added touch of her pearl headband. Many (including myself) thought the Four Button Tiara would be Princess Sofia's first tiara from the family collection, and it turns out we weren't far off. This is way better than her look on night #1, I must say - both dress (from Swedish brand Stylein) and hairdo. 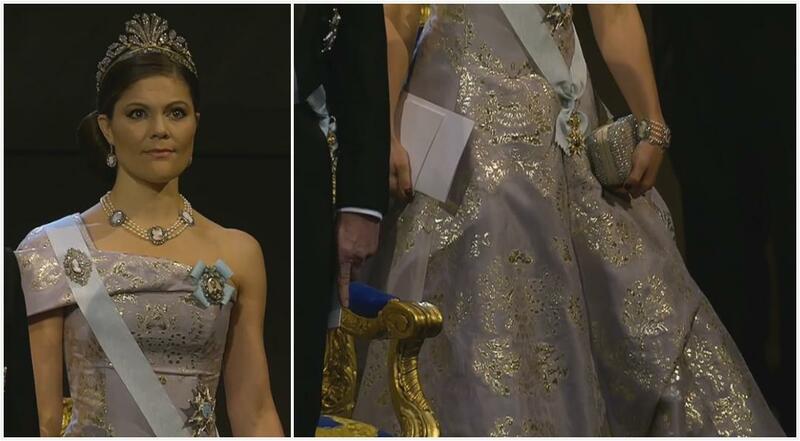 Crown Princess Victoria used Princess Lilian's Laurel Wreath Tiara, along with a repeated Jenny Packham gold gown. I want to like this one more than I do; it's very tall with most of her hairstyles. Princess Madeleine really brought the tiara interest. She wore the Modern Fringe Tiara, her most predictable choice, but proved she wasn't ready to let the Connaught Tiara go: she's wearing it in necklace format! You can't really see it on top of her Valentino gown, but I don't mind. I'm just glad she piled it on.